Hospital are dangerously full; wards could be closed to new patients in just two weeks, the Nurses' Union warns. 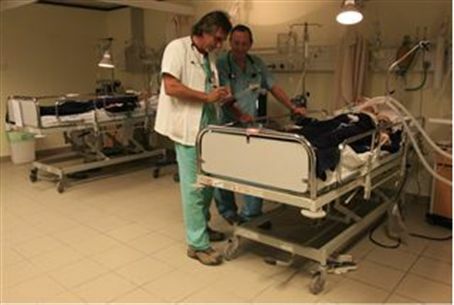 Israel's hospitals are in a crisis, with overcrowding becoming more and more common and nurses unable to provide adequate care, according to the Nurses' Union. Chairwoman Ilana Cohen wrote to Deputy Health Minister Yaakov Leitzman on Tuesday with a warning. If the issue of overcrowding is not addressed within two weeks, nurses may begin to turn new patients away from already full wards, Cohen said. As the years go by, hospitals see an increasing number of elderly patients, many of whom require round-the-clock care, said Cohen. The percentage of patients on respirators has “skyrocketed,” and many wards are at 150 percent of capacity even when it is not flu season. “In their hour of need, hospital patients lie abandoned in beds placed in hallways or passageways for everyone to see – dealing a serious blow to our ability to give them proper care and to their basic right as human beings to dignified care,” she said. While hospital managers have opened special wards for patients on respirators, the move was not accompanied by an increase in manpower, she added. “Under these circumstances, in light of the number of patients, and the complexity of the cases, compared to the number of carers and the physical resources available, nurses cannot provide safe and suitable care, and will be forced to close down the wards for as long as the number of patients exceeds the number allowed by the Health Ministry,” Cohen warned. She called on Leitzman to hold an urgent meeting, and to inform hospital managers that they have two weeks to solve the problem.